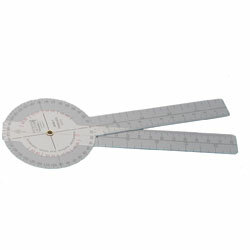 This goniometer has clear plastic construction which permits observation of joint's axis of motion and its range of motion. The 360° head has three scales calibrated to use with the ISOM (International Standards of Measurement) system, marked in 5° increments. Linear scale in both inches and centimeters. Measures 7.875 inches long.